^ 2.0 2.1 2.2 2.3 2.4 2.5 2.6 2.7 2.8 2.9 World Factbook: Iran's entry. Central Intelligence Agency. 2008-10-28 [2009-11-06]. ^ PressTV: Iran inflation rate falls to 9.4%. Retrieved July 5, 2010. ^ Central Bank of Iran: Economic Trends 2008/2009. Retrieved July 4, 2009. ^ Mehr News Agency: Iran's Unemployment Rate Hits 14.6%. Retrieved September 24, 2010. ^ Doing Business in Iran 2010. World Bank. [2010-08-20]. ^ 9.0 9.1 9.2 Iran's entry. Microsoft Encarta. 2008 [2010-07-24]. （原始内容存档于2009-10-31）. ^ 10.0 10.1 IRNA: Crude price pegged at dlrs 39.6 a barrel under next year's budget. Retrieved December 5, 2008. ^ Development Economics, Development Data Group (DECDG). (PDF). Iran at a glance (World Bank). 2009-03-27 [2009-07-12]. ^ PressTV: Iran privatizes $63bn of state assets. Retrieved January 28, 2010. ^ PressTV: Iran oil exports top 844mn barrels. Retrieved June 16, 2010. ^ Foreign and CommonWealth Office: Iran's entry. Retrieved June 21, 2009. ^ The Rise of the Pasdaran: RAND corporation. Retrieved June 10, 2010. ^ 20.0 20.1 Wall Street Journal: Iran's Economy Feels Sting of Sanctions. Retrieved October 13, 2010. ^ Financial Times: Tehran exchange extends advance. Retrieved November 8, 2010. ^ U.S. targets Iran's vulnerable oil. Los Angeles Times. 2007-01-08 [2007-07-17]. （原始内容存档于2007-01-18）. ^ Energy subsidies reach $84b. Iran-Daily. 2007-01-08 [2008-04-27]. （原始内容存档于2008-05-06）. ^ Transparency International: Iran falls to 168 in Corruption Perception Index 2009 . Retrieved November 19, 2009. ^ Freedom House: Iran Country Report. Retrieved October 29, 2009. ^ Iran Daily: New Plan Focus On Subsidies. Retrieved July 23, 2010. ^ Iran Daily: Gov’t Set to Change Economic Course. Retrieved June 5, 2009. ^ World Economic Forum: Iran ranks 69th out of 139 in global competitiveness. Retrieved September 18, 2010. ^ Bloomberg: Iran Has Foreign Exchange Reserves Topping $100 Billion, Ahmadinejad Says. Retrieved November 28, 2010. ^ 35.0 35.1 Iran Inflation Rate. Index Mondi. 2009 [2011-02-05]. ^ Iran's inflation reaches four year low. Retrieved February 27, 2010. ^ Frances Harrison. Huge cost of Iranian brain drain. BBC News. 2007-01-08. ^ Gheissari, Ali. Contemporary Iran: Economy, Society, Politics. USA: Oxford University Press. 2009-04-02: 3–4 (Paperback edition). ISBN 0195378490. ^ Zawaya: Iran Ranks 3rd Among Newly-Emerged Economies. Retrieved October 26, 2010. ^ YouTube上的Iran's Industrial Progresses (Part I). Iran National Film Centre (circa 1975). Retrieved January 20, 2010. ^ YouTube上的Iran's Industrial Progresses (Part II). Iran National Film Centre (circa 1975). Retrieved January 20, 2010. ^ Migration information source: Iran. Retrieved July 18, 2009. ^ Gheissari, Ali. Contemporary Iran: Economy, Society, Politics. USA: Oxford University Press. 2009-04-02: 7–8 (Paperback edition). ISBN 0195378490. ^ Iranian Economy in Six Snapshots. Payam-e Emruz; Economic, Social, Cultural (Monthly). 2001-02-23 [2007-07-17]. （原始内容存档于2007-09-27）. ^ Globalsecurity.org: Iran-Iraq war (1980–1988). Retrieved October 21, 2009. ^ Iran's GDP to grow by $55.5B: The Economist. Retrieved April 7, 2010. ^ 49.0 49.1 Memorandum – The foreign trade regime of the Islamic Republic of Iran, Ministry of Commerce (Iran). Retrieved April 8, 2010. ^ Radio Free Europe: Sanctions And Iran's Achilles Heel. Retrieved October 13, 2010. ^ International Monetary Fund: World Economic Outlook Database (Iran). Retrieved July 25, 2010. ^ BBC: Iran's Guards in $2.5bn rail deal. Retrieved November 12, 2009. ^ Profile: Iran's Revolutionary Guards. BBC News. 2007-10-26 [2008-12-27]. ^ Kim Murphy. Iran’s $12-billion enforcers. Los Angeles Times. 2007-08-26 [2008-12-27]. ^ Azadeh Moaveni. Iran's Rich Revolutionary Guard. Time. 2007-09-05 [2008-12-27]. ^ Michael Slackman. Hard-Line Force Extends Grip Over a Splintered Iran. New York Times. 2009-07-21 [2009-07-21]. ^ Iran Dat by country: Iran, Islamic Rep. World Bank (2011). Retrieved February 5, 2011. ^ Iran's Poor Face a Logjam in the Labyrinths of Work. ILNA.ir, October 21, 2009. Retrieved January 24, 2010. ^ Iran - Income. Encyclopedia of the Nations. Retrieved October 14, 2010. ^ PressTV: 29–33% of Iranians live below poverty line. Retrieved June 7, 2009. ^ Rouznameh, Rasmi. Labour Code. International Labour Organization. 1990 [2009-03-01]. ^ Library Of Congress: Country Profile – Iran. Retrieved April 7, 2008. ^ 67.0 67.1 World bank: Iran – Services for Agriculture and Rural Development. Retrieved April 7, 2008. ^ FAO Statistics Retrieved on 2010-01-30. ^ Business | Crunch time for Caspian caviar. BBC News (2001-06-19). Retrieved on 2010-01-30. ^ Iran Daily: Trade With PGCC To Improve. Retrieved July 23, 2010. ^ Worldbank.org. Retrieved April 7, 2008. ^ IFRstat.org. Retrieved July 23, 2010. ^ Iran Daily: Textile Smuggling Harms Domestic Production[永久失效連結]. Retrieved July 23, 2010. ^ Iran Daily: Textile factories in trouble. Retrieved September 11, 2009. ^ The Economist: Iran 39th Industrialized Country[永久失效連結]. Retrieved July 23, 2010. ^ Iran advances 41 places in industrial production. tehran times. 2010-02-28 [2010-05-10]. ^ UNIDO: Iran's Small and Medium Enterprises. Retrieved February 2, 2010. ^ Torbat, Akbar, (2010) Industrialization and Dependency: the Case of Iran, ECO Economic Journal. ^ Iran to form carpet export consortium. PressTV. 2008-11-09 [2009-03-01]. （原始内容存档于2012-03-25）. ^ Iran Daily: Health Insurance for Carpet Weavers[永久失效連結]. Retrieved July 23, 2010. ^ Financial Times: Iran’s oldest craft left behind. Retrieved February 10, 2009. ^ PressTV: Iran's Handicrafts. Retrieved January 10, 2010. ^ Iran Launches Production of Stealth Sub 页面存档备份，存于互联网档案馆. Retrieved 13 February 2008. ^ IRI exports warfare to 50 countries. Retrieved 12 February 2008. ^ Iran exports military equipment. Retrieved 12 February 2008. ^ Iran 16th Biggest Automaker. Retrieved 12 February 2008. ^ Iran Daily: Gasoline Quota Will Change In Two Months. Retrieved 12 February 2008. ^ Made In Iran. Retrieved 12 February 2008. ^ Mehr News Agency: Iran and car exports projected to reach $1b by March. Retrieved October 24, 2008. ^ Australian Trade: Construction in Iran. Retrieved July 23, 2010. ^ Iran Daily: Housing for All. Retrieved July 23, 2010. ^ Simultaneous Dam, Spillways Construction Obligatory – 30% Drinking Water Wasted. Retrieved 12 February 2008. ^ 70% of Population Own Homes. Retrieved 12 February 2008. ^ US Department of Energy/Iran/Oil 互联网档案馆的存檔，存档日期2010-11-23.. Retrieved October 20, 2010. ^ US Department of Energy/Iran/Natural Gas 互联网档案馆的存檔，存档日期2010-11-02.. Retrieved October 20, 2010. ^ Iran set to build more nuclear plants. PressTV. 2009-03-01 [2009-03-01]. ^ Parstimes: The Economy. Retrieved September 24, 2010. ^ Iran Daily: Iran's oil refining industry needs dlrs 15b investment: Oil Minister. Retrieved October 16, 2008. ^ PressTV: Iran opens world largest ethylene unit. Retrieved June 5, 2009. ^ Press TV: Iran exports $570M of petrochemicals. Retrieved June 5, 2009. ^ Associated Press: Iran oil industry founders. Retrieved 12 February 2008. ^ Iran Daily: Dehloran Refinery Under Construction 互联网档案馆的存檔，存档日期2011-03-29.. Retrieved July 23, 2010. ^ Iran Daily: Company Advances In Energy Capabilities. Retrieved 12 February 2008. ^ Fars News Agency: Iran Ready for Sudden Cut in Gas Supplies. Retrieved July 26, 2010. ^ SHANA: Share of domestically made equipments on the rise 互联网档案馆的存檔，存档日期2012-03-09.. Retrieved July 26, 2010. ^ IRNA: 1st phase of Iran oil stock inaugurated on Kish Island 互联网档案馆的存檔，存档日期2008-03-14.. Retrieved 17 February 2008. ^ PressTV: Oil bourse opens in Iran's Kish Island. Retrieved 17 February 2008. ^ IRNA: Energy Wastage In Iran Equals 6–7 Billion Dollars Per Year. Retrieved November 2, 2008. ^ PressTV: Iran invests $100b in oil industry in 4 years. Retrieved July 14, 2009. ^ IRVL.net: Iran and Nuclear Energy 互联网档案馆的存檔，存档日期2010-12-15.. Retrieved July 26, 2010. ^ Mining to Iran. 澳洲政府. 2007-07-31 [2009-03-01]. （原始内容存档于2009-01-05）. ^ Australian Trade: Mining in Iran. Retrieved April 8, 2008. ^ Mining to Iran. Australian Government. 2007 [2011-02-05]. （原始内容存档于2008-06-23）. ^ 122.0 122.1 Iran Plans to Produce 250,000 Tons of Copper in Year to March. Retrieved November 28, 2008. ^ Iran Daily: Steel Self-sufficiency. Retrieved July 23, 2010. 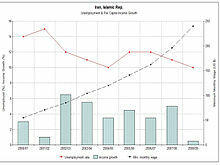 ^ 124.0 124.1 IRNA:Iran: $30 Billion Dollar to be invested in industry. Retrieved November 15, 2008. ^ Tehran Times: Iran exports cement to 40 countries. Retrieved October 31, 2010. ^ Science in Iran: An Islamic Science Revolution?. Retrieved November 15, 2008. ^ Medical Science and Research in Iran. Retrieved December 4, 2008. ^ Iran Daily: Freight Transport Report. Retrieved July 23, 2010. ^ Retailing in Iran. Euromonitor.com. [2010-11-28]. ^ IRNA: Iran's e-commerce to reach rls10,000b 互联网档案馆的存檔，存档日期2009-08-15.. Retrieved December 3, 2008. ^ Australian Trade – Health Sector in Iran. Retrieved 12 February 2008. ^ Australian Trade. Retrieved 12 February 2008. ^ 18% of Medicines Thrown Out Annually. Retrieved 12 February 2008. ^ Travel To Iran – Tourism in Iran. Retrieved 12 February 2008. ^ Country profile: Iran. Retrieved 12 February 2008. ^ PressTV: Iranian Hospitality Industry 页面存档备份，存于互联网档案馆. Retrieved October 1, 2010. ^ Travel To Iran – Tourism in Iran. Retrieved 23 January 2008. ^ PressTV: Iran stock market to see record $5B deal. Retrieved February 14, 2010. ^ BBC: Iran blocks share price gains. Retrieved February 15, 2010. ^ Mehr News Agency: Value of Tehran Stock Exchange to top $70b. Retrieved 12 February 2008. ^ Iran Daily: Vast Economic Potential Lauded[永久失效連結]. Retrieved July 23, 2010. ^ Burkhart, Grey (编). Iran. National Security and the Internet in the Persian Gulf Region. Georgetown University. 1998-03 [2009-07-15]. ^ Privatization of Telecom Companies. Retrieved 12 February 2008. ^ Pyramid Research: Iran Telecom Market Expected to Reach $12.9 Billion by 2014: Report. Retrieved January 24, 2010. ^ Economist Intelligence Unit: Iran. Retrieved December 5, 2008. ^ Iran Daily: Software Exports Hit $45m. Retrieved July 23, 2010. ^ RAI.ir. Retrieved April 8, 2008. ^ United States Institute of Peace: The Revolutionary Economy. Retrieved November 17, 2010. ^ FPC.state.gov Retrieved 23 January 2008. ^ Rand.org, The Rise of the Pasdaran. Retrieved June 10, 2010. Hossein-Zadeh, Ismael. How Parasitic Finance Capital Has Turned Iran’s Economy into a Case of Casino Capitalism. Global Research. 2016-08-20 [2016-08-21]. Hossein-Zadeh, Ismael. Iran’s "Open-Door" Economic Policy: Recipe for Indebtedness, De-industrialization and Dependence Under the Helm of President Rouhani. Global Research. 2016-03-26 [2016-06-07]. Khajehpour, Bijan. Preventing Iran's post-sanctions job crisis. Atieh Group (Al-Monitor). 2015-07-17 [2015-07-27]. （原始内容存档于2016-08-11）. Khajehpour, Bijan. How the nuclear deal will help Iran's economy. Atieh Group (Al-Monitor). 2015-04-10 [2015-04-12]. Iran's Neoliberal Austerity-Security Budget. Hooshang Amirahmadi (Payvand.com). 2015-02-16 [2015-02-21]. Khajehpour, Bijan. Iran's new budget to focus on privatization, subsidy reforms. Atieh Group (Al-Monitor). 2015-01-08 [2015-02-02]. Stecklow, Steve; Dehghanpisheh, Babak; Torbati, Yeganeh. Assets of the Ayatollah. Reuters. 2013-11-11 [2013-10-07]. Iran's bold economic reform – Economic jihad. The Economist. 2011-06-23 [2012-04-07]. Behdad, Sohrab. Where Did Iran's Islamic Economy Come From and Where Did it Go?. Payvand.com. 2010-10-25 [2010-10-25]. Askari, Hossein. Iran's economic self-mutilation. Asia Times Online. 2008-08-26 [2010-10-18]. Ambitious modernization program for the Tehran Stock Exchange. Global Investment House. 2008-06-22 [2010-10-18]. （原始内容存档于2012-11-15）. Higgins, Andrew. Inside Iran's Holy Money Machine. Wall Street Journal. 2007-06-02 [2014-07-23]. （原始内容存档于2016-03-14）. Still failing, still defiant. The Economist. 2004-10-09 [2017-07-23]. Klebnikov, Paul. Millionaire Mullahs. Forbes. 2003-07-21 [2008-03-16]. Amuzegar, Jahangir. The Islamic Republic of Iran: Reflections on an Emerging Economy. New York, USA: Routledge. 2014-10. ISBN 978-1-85743-748-5. Parvin, Alizadeh; Hakimian, Hassan. Iran and the Global Economy: Petro Populism, Islam and Economic Sanctions. London, U.K.: Routledge. 2013-10. ISBN 978-1-315-86720-5. Ayse, Valentine; Nash, Jason John; Leland, Rice. The Business Year 2013: Iran. London, U.K.: The Business Year. 2013-01. ISBN 978-1-908180-11-7. （原始内容存档于2015-03-27）. Nash, Jason John; Sasmaz, Aytng. The Business Year 2011: Iran. London, U.K.: The Business Year. 2011-01. ISBN 978-1-908180-00-1. （原始内容存档于2014-04-17）. Gheissari, Ali. Contemporary Iran: Economy, Society, Politics. New York, USA: Oxford University Press. 2009-04. ISBN 978-0-19-537849-8. Wehrey, Frederic. The Rise of the Pasdaran: Assessing the Domestic Roles of Iran's Islamic Revolutionary Guards Corps (PDF). Santa Monica, California, USA: RAND Corporation. 2009. ISBN 978-0-8330-4620-8. Curtis, Glenn; Hooglund, Eric. Iran, a country study (PDF). Washington, D.C., USA: Library of Congress. 2008-04. ISBN 978-0-8444-1187-3. Jbili, A.; Kramarenko, V.; Bailén, J. M. Islamic Republic of Iran: Managing the Transition to a Market Economy (PDF). International Monetary Fund. 2007-03. ISBN 978-1-58906-441-6. Mohammadi, Ali. Iran encountering globalization: problems and prospects. London, U.K.: Routledge. 2003-04. ISBN 978-0-415-30827-4. Parvin, Alizadeh; Hakimian, Hassan. The Economy of Iran: Dilemmas of an Islamic State. London, U.K.: I. B. Tauris. 2001-03. ISBN 978-1-86064-464-1. Homa, Katouzian. The Political Economy of Modern Iran: Despotism and Pseudo-Modernism, 1926–1979. London, U.K.: Macmillan Publishers. 1981. ISBN 978-1-349-04778-9. Annual Review 2013/14 (PDF). Central Bank of Iran. 2015-02. Annual Review 2012/13 (PDF). Central Bank of Iran. 2014-07. A Review of the Iranian Tax System. Organization for Investment Economic and Technical Assistance of Iran (Ministry of Economic Affairs and Finance (Iran)). 2014-01. Katzman, Kenneth. Iran Sanctions (PDF). U.S. Congressional Research Service. 2014-01. Memorandum of the foreign trade regime of Iran (PDF). Ministry of Commerce (Iran). 2009-11. （原始内容 (PDF)存档于2011-07-13）. Ilias, Shayerah. Iran's Economy (PDF). U.S. Congressional Research Service. 2008-06. Austrade. Doing Business in Iran. 2006. （原始内容存档于2006-03-25）. Management and Planning Organization of Iran. Millennium Development Goals (PDF). United Nations. 2004. （原始内容 (PDF)存档于2007-11-28）. Science, Technology and Innovation Policy Review – The Islamic Republic of Iran (PDF). United Nations Conference on Trade and Development. 2016 [2016-10-07]. Iran: Concluding Statement of an IMF Staff Visit. International Monetary Fund. 2016-10-03 [2016-10-12]. Entrepreneurship Ecosystem in Iran (PDF). Iran Entrepreneurship Association. 2014. （原始内容 (PDF)存档于2015-09-13）. IMF Staff Report. Islamic Republic of Iran (PDF). International Monetary Fund. 2014-04. Investment Guide To Iran. Atieh Bahar Consulting. 2014-02. （原始内容存档于2014-03-17）. Regional Economic Outlook: Middle East and Central Asia (PDF). International Monetary Fund. 2011-04. Regional Economic Outlook: Middle East and Central Asia (PDF). International Monetary Fund. Salehi-Isfahani, Djavad. Iranian Youth in Times of Economic Crisis (PDF). The Dubai Initiative. 2010-09. IMF Staff Report. Islamic Republic of Iran (PDF). International Monetary Fund. 2010-03. Economic Prospects for the Middle East and North Africa Region (PDF). World Bank. 2010-01. Normalization of Economic Relations: Consequences for Iran’s Economy and the United States (PDF). (US) National Foreign Trade Council. 2008. The N-11: More Than an Acronym (PDF). Goldman Sachs. 2007-03. （原始内容 (PDF)存档于2010-03-31）. Small and Medium Enterprises in Iran (PDF). United Nations Industrial Development Organization. 2003. Nichols, Brian; Sahay, Sundeep. Building Iran's Software Industry (PDF). University of Manchester (Institute for Development Policy and Management). 2003. Islamic Republic of Iran – Services for Agriculture and Rural Development. World Bank. 1994-06. （原始内容 (PDF)存档于2008-07-23）. Iran Today. The Iranian economy after the JCPOA (Webcast). Tehran, Iran: PressTV. 2016-08. Iran Today. A look at Iran’s 6th development plans (Webcast). Tehran, Iran: PressTV. 2015-08. Iran Today. Iran government’s economic fight (Webcast). Tehran, Iran: PressTV. 2014-08. （原始内容存档于2014-09-01）. Iran Today. Boosting international trade in Iran (Webcast). Tehran, Iran: PressTV. 2014-08. （原始内容存档于2014-08-21）. Iran Today. Leader urges serious pursuit of ‘resistance economy’ (Webcast). Tehran, Iran: PressTV. 2014-03. （原始内容存档于2016-03-04）. Iran Today. Iran’s “Economy of Resistance” (Webcast). Tehran, Iran: PressTV. 2012-03. （原始内容存档于2012-06-03）. Iran Today. Iran's New Commercial Law on a Five-Year Trial run (Webcast). Tehran, Iran: PressTV. 2012-03. （原始内容存档于2012-03-05）. Iran Today. 1391: Year of National Production, Supporting Iranian Capital and Labor (Webcast). Tehran, Iran: PressTV. 2012-04. （原始内容存档于2012-04-07）. Iran Today. Iran's economic overhaul (Webcast). Tehran, Iran: PressTV. 2011-10. （原始内容存档于2012-01-04）. Iran Today. Iran's economic development plan (Webcast). Tehran, Iran: PressTV. 2011-08. （原始内容存档于2011-08-22）. Iran Today. 2011: Year of "Economic Jihad" (Webcast). Tehran, Iran: PressTV. 2011-04. （原始内容存档于2011-10-09）. Iran Today. Iran's Budget Bill (FY 2011) (Webcast). Tehran, Iran: PressTV. 2011-03. （原始内容存档于2011-07-23）. Iran Today. Iran's Economic Reform Plan (Webcast). Tehran, Iran: PressTV. 2010-10. （原始内容存档于2011-01-19）. Karim Sadjadpour. Iran's Economic Health and the Impact of Sanctions (YouTube video). Washington D.C., USA: Carnegie Endowment for International Peace. 2010-04. Davos Annual Meeting 2007 – Voices from Iran (YouTube video). Davos, Switzerland: World Economic Forum. 2007-01.